The last leg of our recent road trip was spent relaxing at Oyster Creek Lodge in Knysna on the Garden Route. Knysna is such a great spot and we absolutely love exploring the beautiful area. We arrived late in the afternoon and immediately dropped our bags to go do a facebook live at the stunning view point of the Knysna heads. It was windy when we got to Knysna but we were so happy that it stopped just in time for us to start the live! After we were finished there we were pretty tired and hungry so we grabbed something to eat and headed back to Oyster Creek. We poured a complimentary night cap and sat out on the deck watching the stars shine over the lagoon before falling into a deliciously deep sleep. I love the fact that Oyster creek is an intimate B&B with loads of character. There is only enough room for maximum of 12 people and it has a lovely comfortable feel to it. 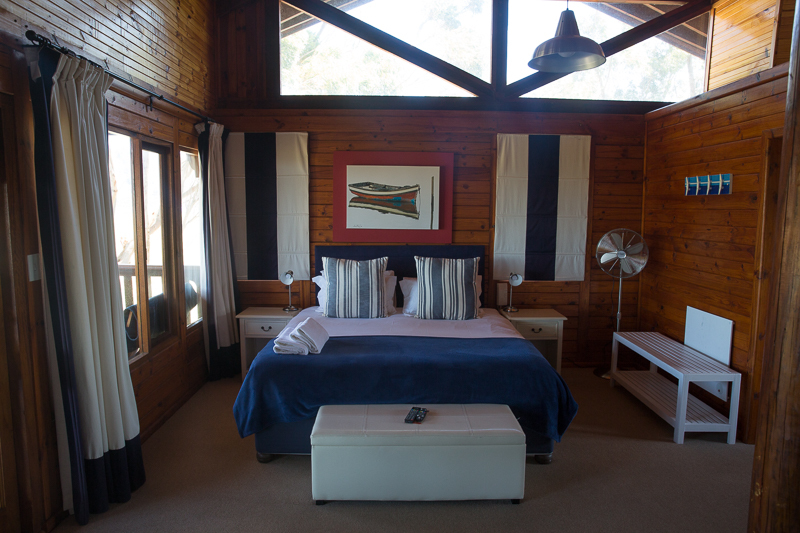 It also fits in great with the surroundings and has the most gorgoeus view of the Knysna Lagoon. We stayed in the loft room at the top and it was really cool. It has a huge bed overlooking the balcony as well as a really nice bath where you can relax and check out the lagoon! The next morning we woke up early, ate a delicious breakfast at Oyster Creek and set off to go explore. We were so close to everything that we headed to the Knysna heads again to go take some photos of the beautiful blue lagoon water and the Featherbed nature reserve. We also drove to Noetzie and headed down a lot of stairs to take a walk on the beach with Castles guarding it. The castles are actually houses and hotels but it looks so cool and its really unexpected as well. It was a gorgeous hot day so when we got back in the afternoon we decided it was most definitely time to hit the pool at Oyster Creek. We grabbed a drink and went to go soak up the sun and splash around a bit before our sunset and dinner plans later that night. After almost falling asleep at the pool we went to go get ready to head out to the Waterfront area. We did not expect Knysna to be so busy on a week night but apparently everyone loves it there so it was absolutely buzzing at the Waterfront! We went for a sunset stroll past all the beautiful boats. Hunger set in at about 7 and we headed to a great little restaurant called Chatter with the best pizza and pasta we have had in a long time! If you are planning to go there for dinner though book in advance as they are always packed. This place is just stunning, it looks really romantic with all the wood. That breakfast with blue cheese looks really tasty. 🙂 Lovely written post about this B&B. I could stay there the whole month. Omg, I was thinking how gorgeous your BnB was until I saw that castle!! I guess I’ve found my new retirement plan! Run a castle BnB! Wow! I’d love to stay in such a place. I love sea view and valley views!! The white sand and blue skies makes me want to take a break so bad. An entire place that hosts only 12 at a time, that’s definitely luxurious! This B&B looks so cute – I really like the sign about the ocean! I much prefer staying at places like this than big chains with less personality. Those views are amazing too, everything looks so blue! It’s places like this that makes me love staying in a B&B. I love that view from the dining spot. And the beach is spectacular! I need to try this out!